The IUCN Species Survival Commission (SSC) is a science-based network of more than 8,000 volunteer experts from almost every country of the world. SSC’s major role is to provide information to IUCN on biodiversity conservation, the inherent value of species, their role in ecosystem health and functioning, the provision of ecosystem services, and their support to human livelihoods. Dr Simon Stuart has spent more than 30 years with the IUCN. Until 2016, Simon was Chair of the IUCN SSC, a position he held for two terms, the maximum allowed by IUCN statutes. During his time with IUCN, Simon headed their Species Programme, served as Acting Director General and led the Biodiversity Assessment Unit. Simon is now the Director of Strategic Conservation at Synchronicity Earth, where he works to reduce extinction rates and promote the recovery of threatened species. As a world-leading zoological institution that manages four wildlife attractions, Wildlife Reserves Singapore (WRS) contributes to the conservation of biodiversity through a number of initiatives, including local and regional conservation support, wildlife research, and awareness campaigns to combat major threats such as the illegal wildlife trade. 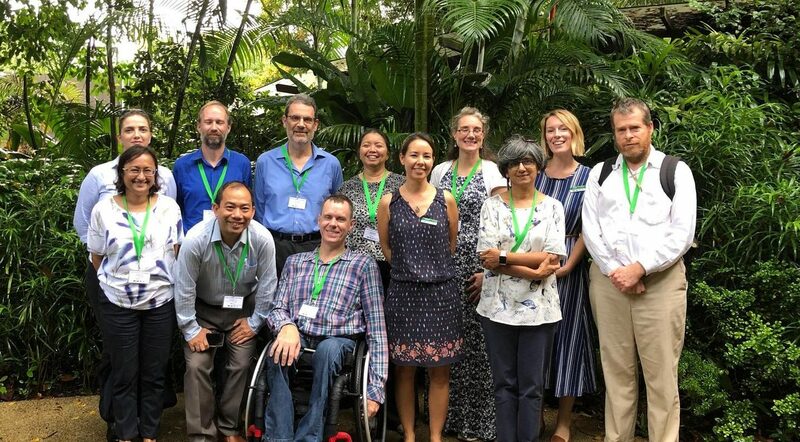 Conservation efforts outside of Singapore are focused on threatened Southeast Asian species, and currently WRS hosts the ASAP Secretariat as well as the CPSG SEA Resource Centre. Two key objectives of WRS’ conservation strategy are regional capacity building and strategic conservation planning. Dr Sonja Luz is Director of Conservation, Research and Veterinary Services at WRS. A trained veterinarian, Sonja has led on the development of strategic conservation investment within WRS and is a leading and influential advocate for conservation within the global zoo community. She is co-Chair of the ASAP Ex-situ Working Group. IUCN is the world’s oldest and largest global environmental organisation. IUCN’s programmes in Asia focus on mobilising communities working for biodiversity conservation, sustainable development and poverty reduction in common efforts to halt biodiversity loss. Alessandro Badalotti is the Senior Programme Officer for Species at the IUCN Asia Regional Office. Previously, Alessandro was the Coordinator of SOS – Save Our Species, the global grant making initiative for the conservation of threatened species and their habitats, formed by IUCN, the World Bank and the Global Environment Facility. Prior to joining IUCN, Alessandro worked for WWF International in the Conservation Strategy and Performance Unit, and in the Mediterranean Programme Office. Bogor Agricultural University in Indonesia is represented on the ASAP Governing Council by the Department of Conservation of Forest and Ecotourism. The department’s mandate is the development of science and technology for forest resources conservation. Dr Mirza Kusrini is a lecturer in the Department of Conservation of Forest and Ecotourism at Bogor Agricultural University. Her research is mostly on the biodiversity and ecology of amphibians. She conducted research on population monitoring and behavioural ecology of ASAP species Bleeding Toad Leptophryne cruentata. Her work on amphibian conservation started from a Conservation Leadership Programme award to work on amphibians of Mount Gede Pangrango National Park in the 2004-2007. This has led to other awards, and the establishment of Indonesian Herpetological Society which she had chaired from 2009-2013. The European Association of Zoos and Aquaria (EAZA) is the largest regional professional zoo and aquarium association. It represents and links over 400 zoos, aquariums and associated organisations throughout Europe and the Middle East. For species conservation, EAZA promotes the holistic ‘One Plan Approach’ to its Members. This recognises that the many species thriving in EAZA zoos and aquariums, alongside the unique skills and knowledge held by EAZA Members, are vital parts of the collaborative efforts of the conservation community to save species. Myfanwy Griffith is the Executive Director of EAZA, where she oversees all services to EAZA Members. She leads on the development and delivery of EAZA’s strategic aims, guiding the direction of the organisation. Myfanwy has a background in leading organisations through periods of growth and is committed to promoting the importance of professional training and education for the zoo and aquarium community. Global Wildlife Conservation (GWC) is an NGO that conserves the diversity of life on Earth by safeguarding wildlands, protecting wildlife and supporting guardians. We maximize our impact through scientific research, biodiversity exploration, habitat conservation, protected area management, wildlife crime prevention, endangered species recovery, and conservation leadership cultivation. Dr Barney Long is the Senior Director of Species Conservation at GWC where he works on the conservation of endangered species and their recovery. His work includes protected area management effectiveness and the prevention of poaching. He has and continues to work extensively on ASAP species including Saola, Sumatran and Javan Rhino, Tamaraw, and Gibbons. Prior to joining GWC, Barney led the Species Programme at WWF-US and before that was based in Southeast Asia for a decade. GreenViet is a Vietnamese non-profit organisation that works to raise awareness about the country’s biodiversity. The organisation has over 200 volunteers that help to monitor illegal activities in Son Tra Nature Reserve. This forest is home to the endangered red-shanked douc langur. Dr Ha Thang Long is the Chairman of GreenViet. He has worked in the wildlife conservation field since 1999 in the Endangered Primate Rescue Centre, Cuc Phuong National Park. Following a study of Grey-shanked Douc Langur ecological behaviour, Long founded GreenViet and signed the organisation up to the Biodiversity Programme of Frankfurt Zoological Society. He has gone on to establish the Biodiversity Conservation Centre in central Vietnam, and is currently an invited lecturer in biodiversity conservation at Danang University. TRAFFIC is a leading NGO working globally on trade in wild animals and plants in the context of both biodiversity conservation and sustainable development. The organisation has over 130 staff working on five continents towards the shared goal of reducing the pressure from illegal and unsustainable trade on biodiversity. Kanitha Krishnasamy is Director of TRAFFIC in Southeast Asia, where she leads the region’s extensive programme on tackling the trade in threatened species. She brings a wealth of knowledge on wildlife trade and conservation policy, allowing the organisation to work together with agencies and partners towards solutions for wildlife challenges. Prior to joining TRAFFIC, Kanitha worked for the Malaysian Nature Society. Wildlife Conservation Society (WCS) is an international NGO whose mission is to save wildlife and wild places through science, conservation action, education and inspiring people. Their goal is to conserve the world’s largest wild places in 16 priority regions, home to more than 50% of the world’s biodiversity. Colin Poole is Regional Director for the Greater Mekong, based in Phnom Penh from where he oversees WCS operations in Cambodia, Chine, Laos, Myanmar, Thailand and Vietnam. Colin first moved to Cambodia in 1997, where he started WCS’s Cambodia Program and directed it until 2004. During his time in Cambodia he was involved in writing and publishing the first Khmer language guides to both birds and mammals in Cambodia, as well as “Tonle Sap – the Heart of Cambodia’s Natural Heritage”. In 2003, the Royal Cambodian Government awarded him a Knight of the Order of Sahametrei for his services to the country.